Looking all over the internet for a simple adding a new line when pressing SHIFT+ENTER... not to be found. So, for the ones who also looked very long, here is an example. //Creating the textfield an adding it on stage. //Just use border to show it easy on stage. //You need multiline for adding new lines. //and adding the new line will not work. //Don't use appendtext for adding a new line, this function does not puts the new line in the correct position. Today I learned an extra feature of adding children into a DisplayObject in reverse. Normally I would make two loops. First one is adding the children, the second is placing the children in reverse. The second parameter sets the child on the first place. In as2 you were able to put a movieclip on top of all the other containing movieclips. I'm working with as3 now and was searching for this same option. 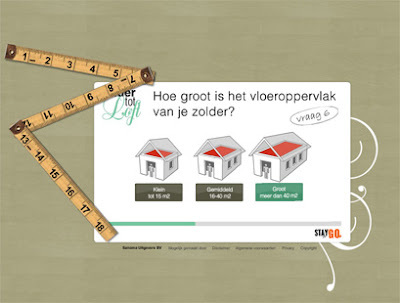 Amercom developed an interactive test to find out what you can do with your attic. Through a serie of questions you will be advised what to do with your attic. Behind the test are some very interesting articles about defining and designing your attic. Our challenge was to create an interactive, creative and simple way to ask the questions. So we used Papervision 3d to show different questions on a floor. You 'fly' above to the next question each time you have choosen your answer. My goal was to find out how to use papervision in an efficient way so every ones framerate was above 20. Another challenge for me was to get the interactivity and Papervision work together. For me it was hard to get the mouse clicked or drag very smooth. But it worked out very well. Ok, at home I was making a new as3 project with flashdevelop. Everything was working great, untill I wanted to use the [embed] code. The compiler gave me this error: Error: Unable to transcode ../images/425400.png. So, I thought to put the image in the /bin directory. not working either. put a '/' before you're path and it works..
After a lot of work, we created a new website for Interhome. It becomes a filled suitcase which checks your holiday character in a motion environment. The style is designed by Benjamin Gouverneur and everything in flash is done by me.. Except the animations inside the suitcase. Martin Strieder is the creative animator. So my job was to put all the pieces together. A very creative, long and exciting project. One of the first big projects for me. special credits go to Benjamin, Wouter, Jeroen and Martin! !